So, I know I just posted cupcakes yesterday, but I was having a serious case of the mondays and needed a chocolate fix. Although, I didn’t really feel like making a whole cake, so I made the recipe into cupcakes. This recipe turned out so yummy, but I had to alter a lot of stuff from the original recipe in order to make it to die for. The original recipe calls for bittersweet chocolate and sour cream, and the cupcakes came out tasting more bitter then sweet. So, I substituted milk to replace the sour cream, then switched the type of chocolate to make the cupcakes more sweet, and wallah! 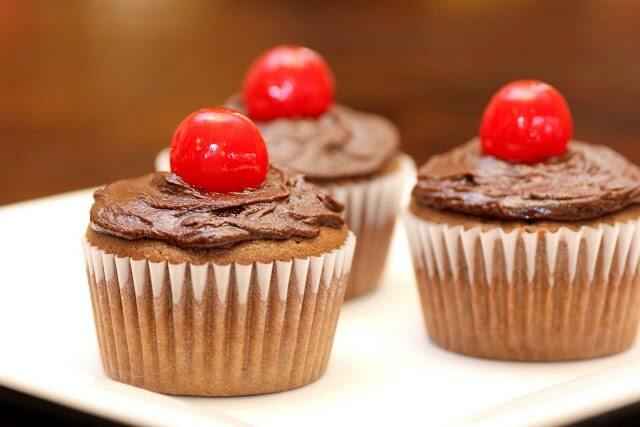 Awesome black forest cupcakes. Everything together turns out so yummy, but I would have to say my absolute favorite part was the cherry cream filling. I can eat that stuff by the spoonful! It’s so so so good. Be forewarned though, that once you try it, you will be snacking on it the entire rest of the time you make the cupcakes. I gave myself a serious stomach ache sampling this stuff while I was baking. One last thing, when you are piping the filling into the cupcakes, push the tip of the piping bag into the center of the cupcake, and fill it until it’s about to overflow. Keep pressure on the bag in order to keep the tip from rising out of the cupcake. You want to really fill these babies up. So don’t be shy. Good luck and I hope you like them!! Preheat the oven at 350 degrees. Line cupcake pan with paper cupcake inserts. Mix the flour, baking powder, and salt in a large bowl. Melt the chocolate and water in a double broiler over barely simmering water. Set aside to cool. Beat the butter and brown sugar in a large bowl with an electric mixer at medium speed until creamy. Add the eggs, on at a time, beating until just blended after each addition. With mixer at low speed gradually beat in the chocolate mixture, milk, and dry ingredients. Spoon batter into cupcake papers, filling about 2/3 the way full. Bake 16-18 minutes, or until a toothpick inserted into the center comes out clean. Cool cakes in the pan for 5 minutes. Then cool on a wire rack for 10 minutes more. Remove center of cupcakes, keeping the caps of cupcake center. Continue to remove middle of the cupcake center until about 3/4 the way down. Mix the jam and maraschino cherry juice, set aside. With mixer at high speed, beat the cream in a medium bowl until stiff. Slowly fold jam mixture into the whip cream. Place cream mixture into a piping bag and cut tip. Fill center of the cupcakes and replace the cap. Melt the chocolate, butter and cream in a double boiler over barely simmering water. Let frosting cool slightly, then spread over the top of cakes. Decorate with the candied cherries.